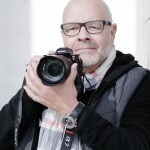 I am an avid freelance photographer living in Berlin. I have been in and out of photography for years. The digitalization of our tools really brought me back into business. My portfolio started with landscape, architecture and travel photography. Lately – trying to be the “daily photographer on the go” – I have expanded into street photography as well. Some time ago – mainly because my clients demanded it when taking pictures of their homes – I delved deep into portrait photography. This led to setting up my own studio with Elinchrom strobes. You can see the first results in my new portrait gallery. I like to travel light. For street photography it doesn’t make any sense to point one of those clunky slr behemoths at people. So I started to shrink my gear. I started off with a micro four thirds system with both Panasonic Lumix and Olympus components besides my trusty Sony SLR with a few Sony lenses and a lot of old Minolta glas which I still had from the good old Dynax 9 days. Some jobs demand more real estate on the sensor. Mercifully Sony came around and gave us the Sony A7 system. I own both the Sony A7r and the A7s and these babies really rock. So enjoy my pictures. If you like some of them – great! But please respect my copyright.